HAMLET — The stats for kidney disease are staggering: One in three American adults is currently at risk for developing kidney disease. Once the kidneys fail, dialysis or a kidney transplant is required. Approximately 450,000 Americans are on dialysis. 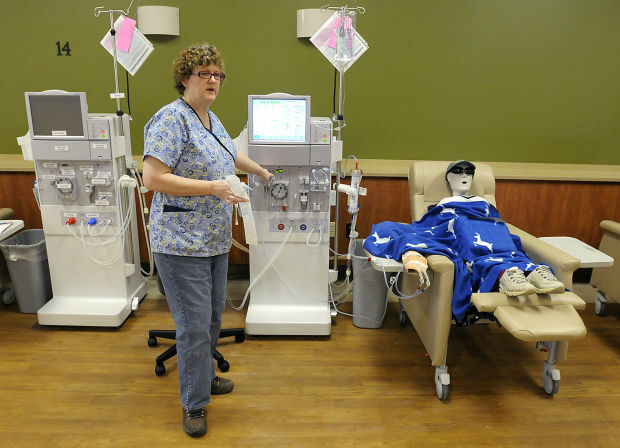 Richmond Community College has a unique Dialysis Technology diploma program that trains technicians to work in dialysis centers, hospitals and other healthcare settings that offer dialysis treatment. Dialysis technicians work in dialysis centers, hospitals and other healthcare settings that offer dialysis treatment. Richmond Community College offers a diploma program in Dialysis Technology. RCC instructor Renea Craven experienced firsthand the need for skilled and motivated healthcare workers when her husband was diagnosed several years ago with kidney cancer that resulted in his being dependent on dialysis treatment. “Dialysis is a life-sustaining treatment, and you want a healthcare provider who is not only knowledgeable but also empathetic because you’re going to be seeing them not just one time but several times a week for several hours at a time,” said Craven, who is Allied Health chair and lead instructor for the Medical Assisting program at RCC. Craven spearheaded the Dialysis Technology program at RCC, which can be completed in one year. Davita Kidney Care operates 10 dialysis centers within a 50-mile radius of Richmond County and has 64 centers in North Carolina and 20 centers in South Carolina. At a national level, DaVita operates or provides administrative services at 2,098 outpatient dialysis centers and serves about 165,000 patients. Fresenius Medical Care is another leading dialysis provider that operates about 20 regional facilities and 2,261 nationwide. Dr. John Shepherd, a nephrologist with Pinehurst Nephrology Associates, said there is a growing need for staffing at dialysis centers. “One of the problems we run into at the unit is we have chairs available, but sometimes we don’t have the staffing available – be it nurses, technicians, social workers or dieticians. To have a conduit of trained technicians from the college would be helpful to get patients in and out more smoothly,” said Shepherd. Shepherd said the medical economy is going to continue to grow, so a technician program such as the one being offered at RCC is a great starting place for students who want to pursue a career in health care. “I’ve known a lot of technicians who started in a dialysis center and ended up going into medical school,” Shepherd said. For Craven, this program represents a lifeline for many, including her husband, who suffer from kidney failure. “When you are dealing with dialysis, you are dealing with someone’s life. This Allied Health program will give people the skill set to be excellent caregivers in our communities and beyond,” she said. RCC is currently enrolling students for the fall semester in the Dialysis Technology diploma program as well as its other certificate, diploma and degree programs. New student registration will be held July 9 and Aug. 11-13 on RCC’s main campus, 1042 W. Hamlet Ave., Hamlet, N.C. Applications can be submitted online at www.richmondcc.edu. For more information, call RCC at 910-410-1700 or visit www.richmondcc.edu.